These projects aim to educate community members on human rights through the issues that directly concern them in areas such as the environment, agriculture, health, work and education. In 2015, 85 young people, vectors of change for their community, took part in activities designed to bring together promising projects encouraging and promoting civic engagement. 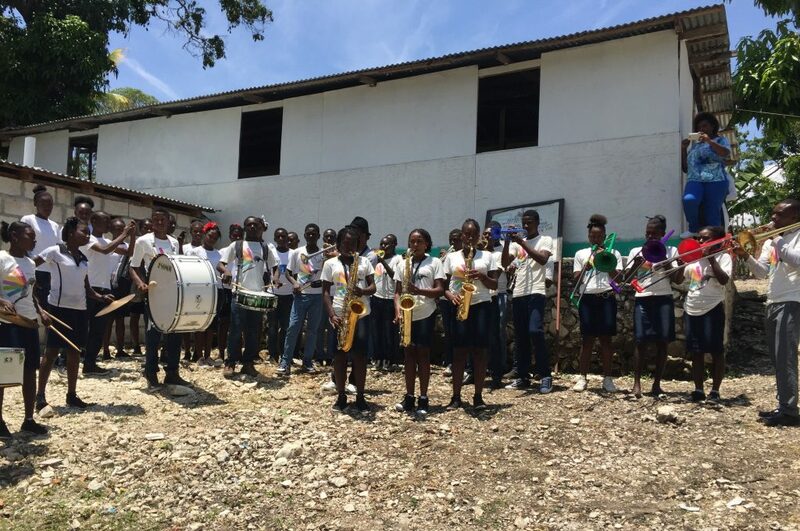 Following a visit to Baille Tourible in 2014, Régine Chassagne made it her personal goal to gift instruments to the young people of the community so they could start their own marching band. Ever since, with the support of a teacher and an assistant, a group of 45 teens are learning music. In addition to gaining confidence in themselves, these young people have become the pride of the entire community! Moreover, through this training, some young people are now contracted out by neighboring communities. In collaboration with the Canadian organization Equitas, KANPE is working to develop a training program to build the capacity of local leaders and integrate a participatory process that respects human rights.